England and Italy are covered so if you need a stove and a heat bank just get in touch, wherever you are, and I’ll get them to you. My usual transport goes from England to Italy every 2 weeks via France so sensible heating is equally available there. Just fill in the contact form below and we can start to chat. A system makeover might seem like a daunting prospect but it can often be as simple as connecting a new tank in your technical room to a few pipes that are already there. The most essential connection is to the wood burning stove; all the other power sources like solar and gas can be added later. There is an immersion heater on the tank to provide backup power if it is ever needed. A heat bank and stove can be shipped out in about 6 weeks and installed in as little as 2 days. Not only will your heating bills reduce dramatically but you’ll be cosy and in most cases safe from power cuts. If you were snowed in for 2 weeks without power would your existing system give you heat and cooking facilities? System continuity in a power cut is one of the most important considerations when designing rural heating systems. Make sure you are safe and comfortable this winter. There is a contact form below. If you buy a stove and tank together I’ll arrange solar panels at trade price – like a big 3 panel kit with pump, controls and fluid for €2,000 + IVA. This is top quality Italian kit at a spectacular price especially as it‘s in Euros. If you are in the UK or France I’ll do a similar deal and get the panels sent out to you from Italy. We’ve had the Energy Performance Certificate done on our Italian farm house as it’s up for sale. All the eco systems fitted to the house were officially vindicated by an unusually high ‘C’ rating, narrowly missing a ‘B’, so this proves that old stone houses can be efficient. Apparently the energy rating is an important factor as far as house buyers are concerned and quite rightly so as the wrong systems can cost a fortune to run. The whole energy package actually returns a profit every year but we were still relieved that the applied criteria gave a respectable result. If you’d like to talk about a high performance heating system like this please get in touch using the contact form below. Many versions of the system have been fitted in Italy and several refinements have been added to make it a well honed product known to the supplier as ‘The Italian Job’. Gas Gas Gas! If you live in the UK and have access to town gas you have enviably cheap energy. About 3p/kW.hr in fact which means a big 28kW gas boiler costs about £1 an hour to run and 50p for the typical smaller boilers. Knowing that winter lasts for about 200 days gives you a guide to your potential gas bills; 4hrs a day = up to £800 down to £400. The exact cost depends on the boiler efficiency of course and a condensing boiler will get around 93% (versus as bad as 75% for an old one) but – and here’s the rub – only if the temperature of the return water is low enough to enable the latent heat to be condensed out of the exhaust gases. Upping your efficiency to 93% will save about £280 a year so the boiler is a good idea but it will only return a good result with low return temperatures. The best way to guarantee this is to fit a new tank or, to be specific, a heat bank like the one from Specflue. This stainless steel tank has a long list of benefits, such as integrating solar, wood stoves, under-floor etc but with regard to gas use and hot water delivery it is particularly impressive. The gas boiler is directly connected to the tank (i.e. no coil) and can deliver full power to hot water to give fantastic recovery times and also continuous use of multiple outlets rather like an overpowered combi-boiler. The return temperature is managed and always correct for condensing mode. Hot water is extracted via an external heat exchanger so the hot water is fresh and pressurised so you can fill the kettle and saucepans with hot water. The pressure you get from your hot taps will now be the same as your cold taps which will put a bit of zing into a previously dribbly shower. Don’t be put off by last winter’s bad press on condensing boilers – ‘Thousands left without heat in cold snap’ etc. Plumbers were quick to blame the kit but it was the condensate drains freezing and this problem can be bypassed with a break in the tube; the water drips into a funnel and any overflow is caught by a small plastic bowl. I used uSwitch to get a deal for 12.251 p/kW.hr after an informative chat with one of their advisors. A £400 annual saving so well worth the cost of a phone call. He will also tell me when a better rate comes up for a free switch to another provider.. It was interesting to note that Economy 7 at 6.232p/kW.hr was still twice the price of gas so the immersion heater is pretty much redundant as is economy 7 itself in most cases. The exception would be an air source heat pump where, despite a poor night time COP due to low temperatures, one would still be running a little cheaper than gas. The all electric eco-house is a possibility then. UK electricity is almost half the cost of Italian electricity. As a rule of thumb every 1kW for 8 hours a day will cost you £1 (£365 a year) and this could be near your current use as a power meter usually reveals background consumption of around 1kW with a few lights, fridge and computers. Replacing a 60W bulb with a 10W LED saves 5p in just 8 hours (£18 a year) so chuck all those old bulbs in the bin NOW and remember those curly CFL bulbs are not comparable so go straight to LEDs. 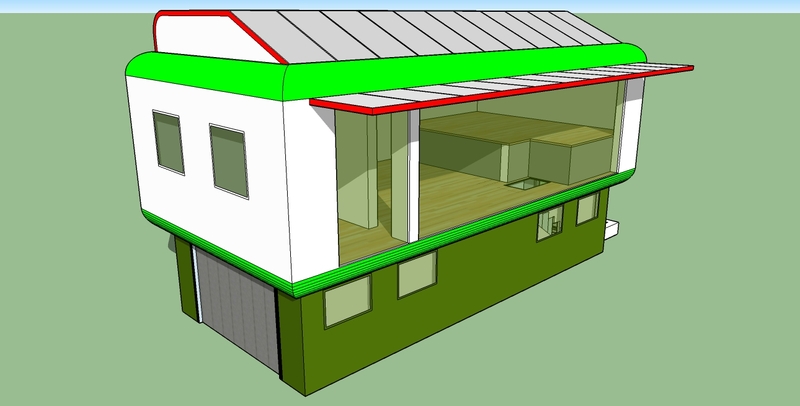 I was thinking about a small but overtly modern eco-house design a while ago and realised that it could not be smaller than the panel area required to run the small air source heat pump on a winter day. So the design is basically a big set of panels with a small house underneath. A 6kW array would be good for just over 2kW, just enough to run a small ASHP which in turn would be able to heat the well insulated house. Here is a sketch of what the house could be like. Using modern building materials it would be unusually low priced for the amount of space provided.